Heather HochFresh flowers, gelato and a green sea of Tuscan kale at the Esplanade farmers market.The Spot: Camelback Esplanade Farmers Market, open Friday from 9:30 a.m. to 2 p.m. The Camelback Esplanade Farmers Market is full of irresistible sweets and, well, we couldn't resist. Thanks to Gelato 64, we had a sweet breakfast of salted caramel andgrapefruit gelatos. The smallest size is $4, but since it's so rich and creamy, you won't need much more than that to get a sugar rush. Urban Table impressed us yet again with their sriracha peanut butter chocolate chip cookies. Though they cost $12 for a small pack, we think the flavor explosion is worth the financial splurge. Not quite what most would consider sweet, we also picked up spring onions from TJ Farms' stand, which were $1 a pound. Their delicate, light flavor makes them a perfect addition to any spring salad recipe. Plus you don't get awful onion breath from these little beauties. Traci Zitzer and Russell "RJ" Johnson are one dynamic duo. 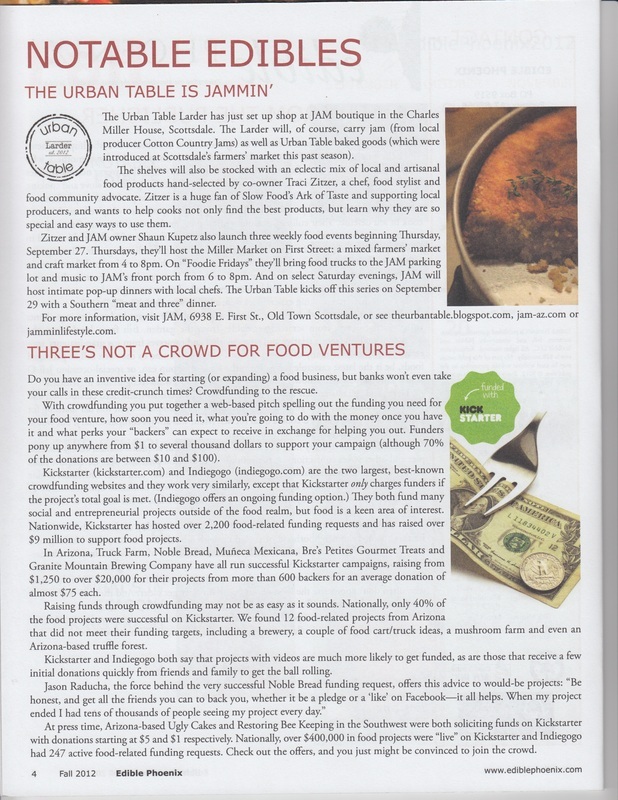 After forming a friendship early on in middle school and going on to serve 30-plus years in the restaurant industry, the two business partners decided form Urban Table: A Working Chef's Market. 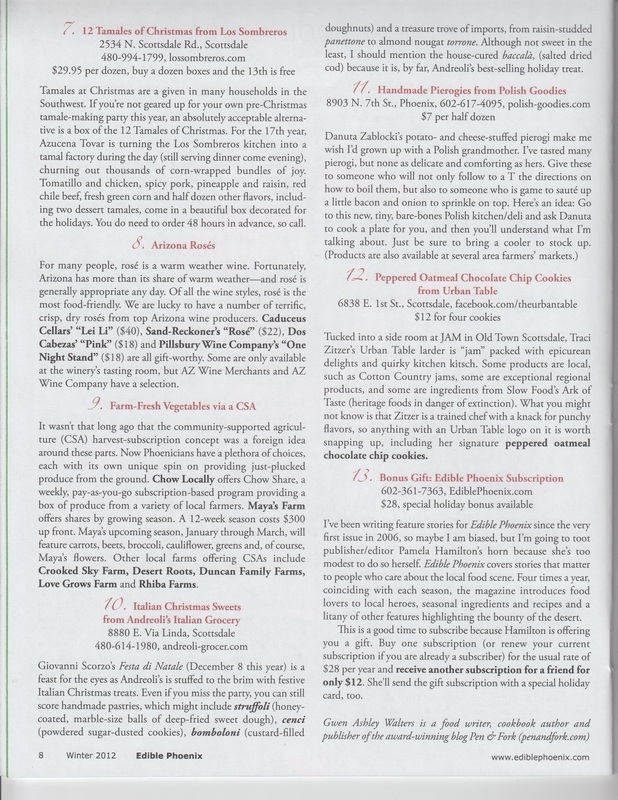 Starting their way at farmers markets and ultimately setting up Urban Table Larderinside Scottsdale's JAM Boutique, Zitzer and Johnson pride themselves on knowing both their products and their people. "When we first started this business we decided to make two things very clear -- we had to laugh, because we're on the second half of our lives," says Zitzer. " [And secondly,] we decided if we were going to make this commitment, we would have to work with people who would want to learn, people who we would want to break bread with." And true to form, in just a little over a year of starting their business, Zitzer and Johnson have broken bread with much of the growing foodie community in Phoenix -- tasting, sampling, and selling both their own products and the specialty goods of their vendors. Which is why, despite this being their first Caramelpalooza, Zitzer and Johnson are sure to be two of the more familiar faces there. 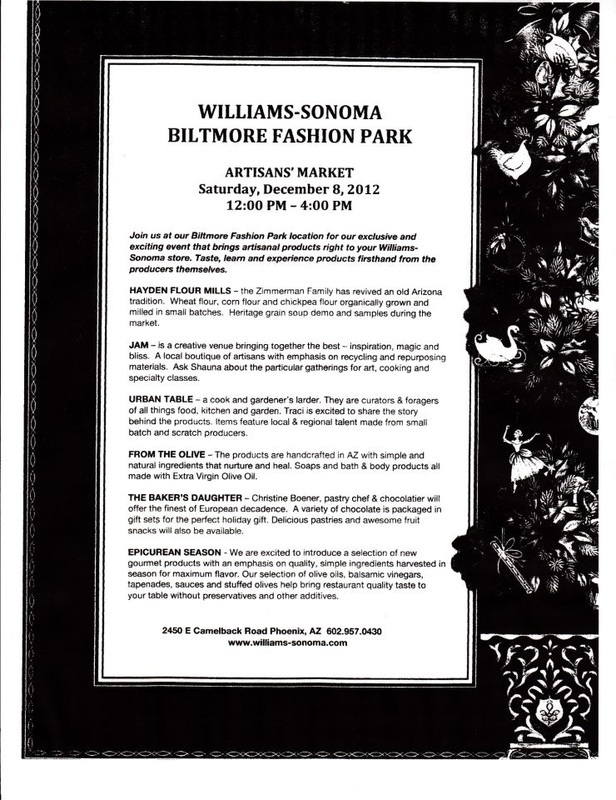 Announcing the Caramel Makers for Smeeks & Chow Bella's Caramelpalooza 2013! 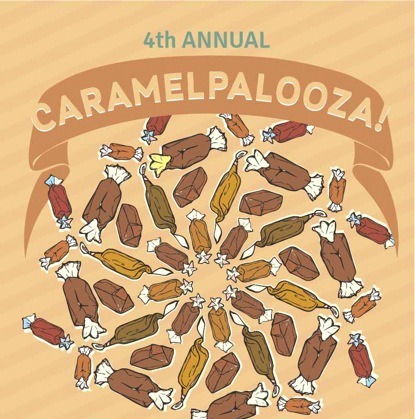 We are practically in a sugar coma, just thinking about the line-up for Caramelpalooza 2013 -- the biggest and best ever, if you ask us. - Caramelpalooza 2012: The Winners! Right? It's quite a collection of confectioners. Caramelpalooza 2013 will take place Friday, April 5 from 7 p.m. til the caramel runs out, at the Biltmore Fashion Park, the new home to Smeeks, which is partnering with Union and Chow Bella to bring you the fourth annual event. Keep an eye on Chow Bella in the coming weeks for information about purchasing tasting tickets (to benefit the Arizona Humane Society!) and for profiles of the candy makers. Heather HochWe really wanted that chutney...What We're Still Lusting Over: The hardest part of any market trip is what we have to leave behind. Urban Table's super tart and tasty $12 jars of roasted lemon chutneywould have given life to the beautiful greens we got at McClendon's. The tea party ready tartes and pies from Classic Cakes and Confections were almost too cute to eat--so we didn't... this time. Our last lusted over, left behind item are Bonny's Garden's $6 garden truffles. The little earthy balls are filled with seeds for different herbs, so you just stick one in a planter and voila- you have an herb garden. We're filing this find under future X-mas gift ideas for sure. Cowboy Ciao is spicing up your Wednesday, and possibly getting you tipsy, with a twist on their "sommelier showdown." This time the showdown event is "Sadie Hawkins" style with ladies preparing the main course and pairing them with wines. And instead of waiting to be asked on a date to the dance, the fellas are making themselves useful and preparing desserts paired with cocktails. In total, there are seven chefs, 4 main dishes and 3 desserts. If you go, be prepared to eat and imbibe. Lots. The main course features savory dishes prepared by four ladies in a "chicks cooking chicks" theme. They will also be preparing poultry dishes like "duck dog" on a pretzel bun, fried chicken and smoked turkey tamales. The guys making the desserts and pairing them with cocktails are Cowboy Ciao's Executive Chef Lester Gonzalez and his team. The dinner is just for 50 people on January 23, so be sure to call to reserve a seat. The plan is to move to Kaz Bar (Kazimierz World Wine Bar) for the dessert, where "mix master" Wednesday will be going on- so you can continue your evening into the wee hours. 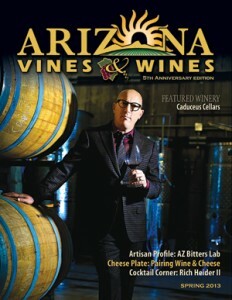 Seats are $60 and can be reserved by calling the restaurant at 480-946-3111. Housed in an adorable 1913 bungalow (once owned by Charles Miller, for whom Miller Road was named), JAM is an artisan boutique and art venue where local artists are featured and artsy classes are taught. 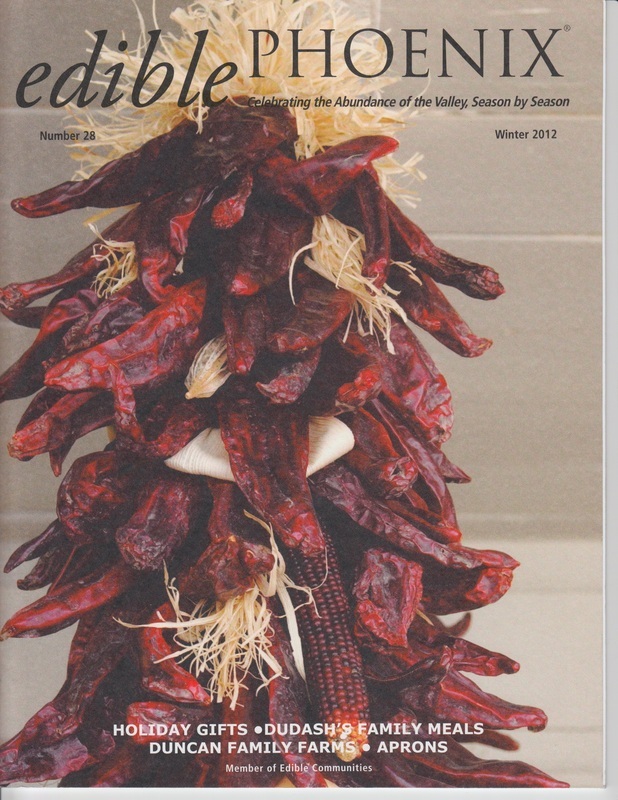 The rustic couture shop is filled with products that are recycled, re-purposed, handmade, and homemade. Owned and operated by Shauna Kupetz, JAM will get a little sweeter in September, whenTraci Zitzer of Urban Table transforms one room of the shop into Urban Table Larder, a gardening and provisions store featuring nonperishable foodstuffs that Zitzer calls "small batch and from scratch, the best of the best." Zitzer, a trained chef who has followed the fancy-food show business for eight years, plans to showcase food artisans, many of whom can't afford a brick-and-mortar space. Her larder will carry local and regional honeys, jams, olive oils, chutneys, sauces, syrups, vinegars, scented sugars and the like as well as gardening tools and gloves, trugs, seed bombs, tea towels, aprons, and other kitchen items. Zitzer also plans to carry polenta and flour from Hayden Flour Mill as well as products from Slow Food's Ark of Taste -- an international catalog of foods threatened by industrial standardization. BuchananJAM's interiorUrban Table Larder will have a soft opening on September 4, but thegrand opening bash -- a three-day event -- begins on Thursday, September 27 with Miller Market on 1st Street, a farmers market held in JAM's parking lot from 4 to 8 p.m. Although Kupetz doesn't have all the vendors pinned down yet, she says her market will feature fruits, vegetables, fresh flowers and hand-made treasures from local artisans and artists. Kupetz expects the market to be a regular Thursday night event tied in to Old Town's Art Walk. The following day -- Friday, September 28 -- will be called Foodie Fridays, a roundup of five food trucks (organized by Kupetz, input provided by Short Leash Dogs), parked at JAM from 6 to 8 p.m. Local musicians will jam on the porch. On Saturday, September 29, Zitzer will kick off the first Saturday Night Supper, a local chef pop-up limited to 12 seats. Although her menu isn't etched in stone, she's considering a Southern-style Meat and Three, offering cider-braised pork chops and yummy sides, including Jeff Zimmerman's polenta. As with the previous two events, this one will also be ongoing. Down the line, Kupetz, Zitzer and Zitzer's business partner R.J. Johnson (who graduated CIA and has loads of experience in the restaurant business) hope to host Edible Education Dinners (dinner and class) as well as gardening classes. They've already begun soliciting local chefs. Shauna Kupetz likes to spread the JAMTonight -- from 5 to 8 pm -- Shauna Kupetz of JAM and Traci Zitzer of Urban Table Larder (a cool provisions store within JAM) are co-hosting their second Miller Market on 1st Street,, which Kupetz maintains is not a regular farmers market but rather a community event bringing art and artisanal food together. Held in the parking lot of JAM at 6938 E 1st Street in Old Town Scottsdale, Miller Market is a relaxed, family-friendly event showcasing local farmers and local and regional food vendors as well as artists and artisans who specialize in hand-made, re-purposed, recycled and found objects. Tonight's market will also feature a food truck and live music by John Erwin. Kupetz says the market's debut last week was a huge success, as was Foodie Friday -- a roundup of six food trucks that took place at JAM the following night. All six trucks sold out of food. If you're doing Scottsdale's Art Walk tonight, you might want to mosey on over to Miller Market on 1st. Amy SilvermanA vintage cake tin -- go ahead, make my day. To you, this looks like a beat up piece of crap someone bought at Goodwill for a couple bucks. To Mom, it looks like the super awesome, well loved cake tin she's been dying for, and we promise she won't just not mind that you bought it at Goodwill for a couple bucks, she'll applaud you for it. Go to etsy.com for deals on vintage kitchen items, or hit upKitchen Switchin', a consignment boutique in Phoenix for less tarnished but still wonderful treasures. This fall, Traci Zitzer opened a tiny dream of a shop in a room of the old house that serves as home to JAM, a boutique in Old Town Scottsdale. Now JAM's housing not only Zitzer but a Thursday evening market and Friday evening food truck event. You'll be pleased if you only make it to Urban Table Larder, which features an amazing spread in such a small place: artisan-made salts, sugars, syrups -- all non-perishable items designed to make a mom/chef drool. Top off your basket with some kitchen tools and a bauble from JAM, and you'll have one happy maternal unit. Until any of our favorite local ice cream makers bust out with their own cookbooks, we're sticking with Jeni's guide to homemade ice cream -- and alongside we'll give Mom an ice cream maker. Cuisinart makes a good one, or you might want to spring for the new KitchenAid mixer, which our own chef-expert Andy Broder recommends for the cool ice cream attachment. This is a gift Mom can experiment with on her own, or with the kids. And you'll get to be a guinea pig (or just a pig). What could be better? ​Spring has sprung, and Old Town Scottsdale Farmers' Market is celebrating throughout the month of April with a bushel full of classes hosted by Terri Nackeof La Bella Terre. The Market's founder Dee Logan says, "It is so important to educate our community about the wide expanse of local growers and artisans and how to use market fresh ingredients in their own kitchens." We couldn't agree more, and did we mention that these fresh-from-the-farm classes are completely free? April classes feature sweet and savory cake, tomato jam and ketchup making, an Earth Day celebration, and even market fresh mixology. Classes are scheduled every Saturday from 10:30 - 11:30 a.m. There are only 25 slots available on a first come, first served basis on the morning of every class. So, mark your calendars now and get there early. 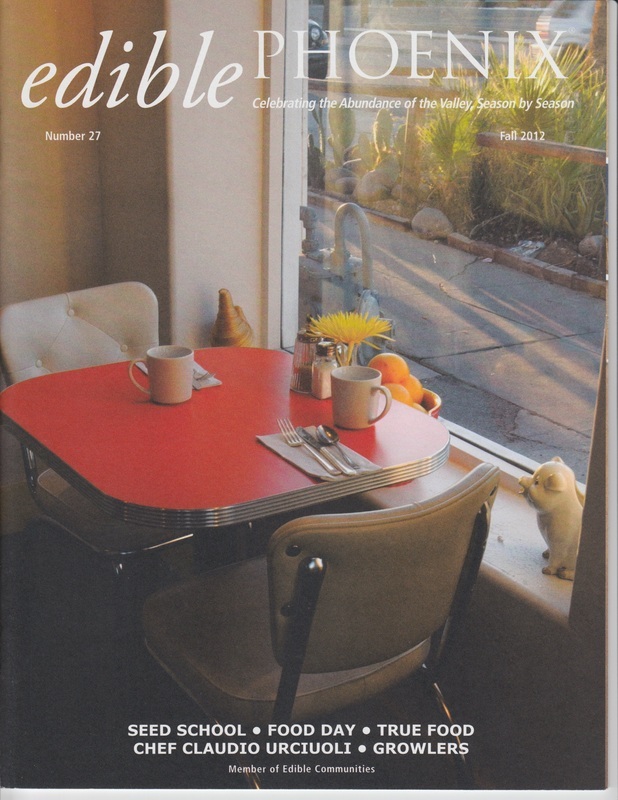 Find the full Edible Education class list after the jump. April 7th -- Crafting Cake! This class has the sweet and savory touch, featuring a polenta olive oil & honey holiday cake made by Traci Zitzer of Urban Table. Learn to preserve your fresh tomatoes with a jam and ketchup making class with Rebecca Kidwell of Farmyard & Guy Gillespie from On The Vine. Join Charles Wiley of Café Zuzu & Chow Locally CSA in a class featuring produce from all of the market's growers. Learn how unique cocktails can be crafted from the garden all the way to the glass with Kim Haasarud of Liquid Architecture. photo by Jamie PeacheyCountry Velador is the pastry chef at Cowboy Ciao and the co-owner of Super Chunk Sweets & Treats with her husband Sergio. we didn't absolutely love it, we weren't going to buy it. What is your biggest weakness -- are you a sucker for sales, a certain silhouette, functionality, or something else? I am absolutely a sucker for good design. When something is made well, has been thought through, and is functional, that's great design to me. What store/boutique/designer makes you hyperventilate? Describe you hallmark score, your Hall of Fame purchase. The 1950s blue Italian glass chandelier we have hanging over our dining room table that we bought at Modern Lighting in Phoenix. Definitely serendipitous because we just went in to check out the store. My husband and I bought it, looked at each other, and we each said, "Merry Christmas!" What is the one purchase you can say embodies you the best? What is the one object/piece you think everyone should have at least one of? If you work a lot on your feet like I do, Danskos, for sure! How regularly do you cull? thrift stores. It's all stored in boxes in my closet now. I'll never ever get rid of them. Best place in Scottsdale to shop? Shop at small businesses; adopt from a rescue group or the pound; go to farmers markets and meet the people that are making the products you can buy; when you travel, take an extra day off so you can relax when you get home; appreciate the people around you, while they are still there; eat more dessert. 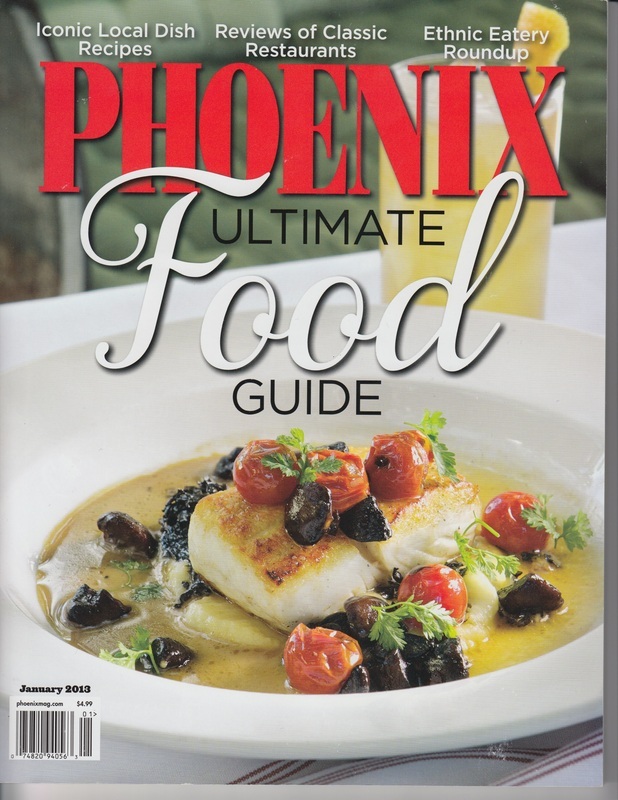 See more Scottsdale food highlights and must-sees in the "Eat" section of this year'sShine. What kind of shopper are you? Strategic, for sure. Some — like my husband — call it frugal, but I call it strategic. I'm always looking for pieces to go in my house. 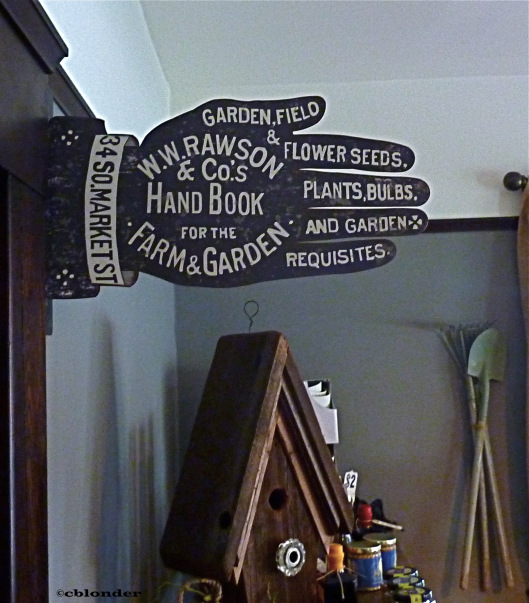 When my husband and I bought our 1948 ranch, we said we had to love everything we put in it, just as much as we love our house. If we didn't absolutely love it, we weren't going to buy it. What is your biggest weakness? Are you a sucker for sales, a certain silhouette, functionality, or something else? I am absolutely a sucker for good design. When something is made well, has been thought through, and is functional, that's great design to me. Describe you hallmark score, your Hall of Fame purchase: The 1950s blue Italian glass chandelier we have hanging over our dining room table that we bought at Modern Lighting inPhoenix. Definitely serendipitous because we just went in to check out the store. My husband and I bought it, looked at each other, and we each said, "Merry Christmas!" What is the one purchase you can say embodies you the best? My Mandarina Duck purses. Simple, straightforward, functional, a little pizzazz without the drama. What is the one object/piece you think everyone should have at least one of? If you work a lot on your feet like I do, Danskos, for sure! How regularly do you cull? Very rarely. In my 20s, I used to wear a lot of vintage clothing that I bought at antique and thrift stores. It's all stored in boxes in my closet now. I'll never ever get rid of them. Best place in Scottsdale to shop? Scottsdale Marketplace at Scottsdale and Lincoln and Urban Table Larder/Jam, which also holds a farmers market on Thursday nights that is full of really cool stuff (6938 E. 1st St., where we also sell products from our candy company, Super Chunk Sweets & Treats). Last summer, Daniel Boulud's dbgb offered an entire pig for up to eight people (plus head cheese to start and Baked Alaska to finish up) for $495. Let's hope this one catches on in Phoenix. Cafe Bink and The Mission are already roasting whole pigs on the weekends, so a whole hog extravaganza sure seems within the realm of possibility, especially since both restaurants already cater using La Caja China (a portable roasting box). Although we all love a good food fight and we got a doozie in 2012 from Pete Wells andGuy Fieri, collaboration and resource sharing is the name of the game this year. Super-freak Anthony Bourdain and haute-shot Eric Ripert contributed to a candy bar called the Good & Evil, made by chocolatier Christopher Curtin. We'll see more shared spaces, more pop-ups and more creative events where farmers, artisans, chefs and winemakers work together. Farmers have had their moment, and yes, we still think they're rock stars. In fact, we're finally learning what's in season and why we don't want to eat a peach in December or Brussels sprouts in August. But this year we'll see more artisan everything -- small-batch distilleries, mustard-makers and charcuterie champs. Here in town, Steve Douds makes his own Wonder Mustard, while So We Meat Again is cranking out smoked and cold-smoked sausages and deli meats. We even have a vodka distillery (Arroyo) in Glendale, and our own Bitters Lab in the East Valley. 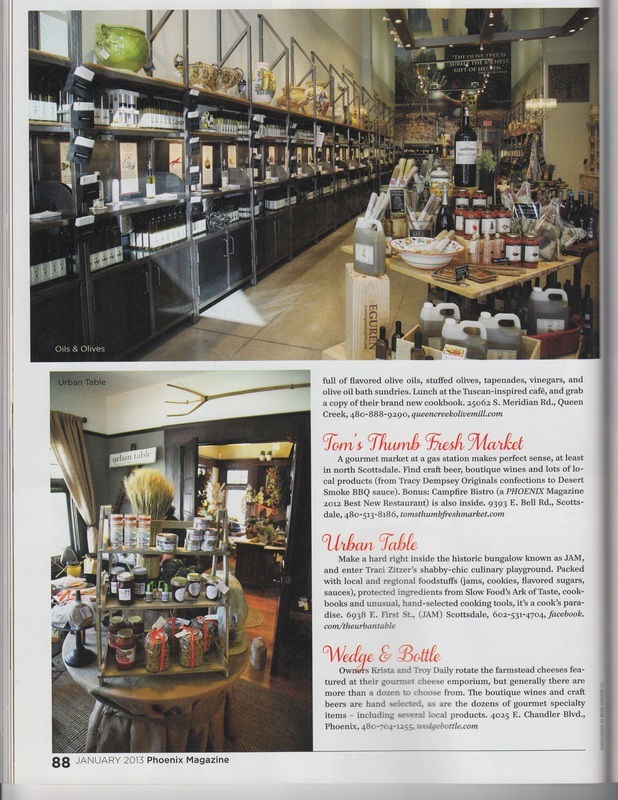 Lots of artisan products can be found atUrban Table, an artisan food shop housed within Jam in Scottsdale. I've barely scratched the surface here. There's so much more. Feel free to chime in on the trends I haven't covered. 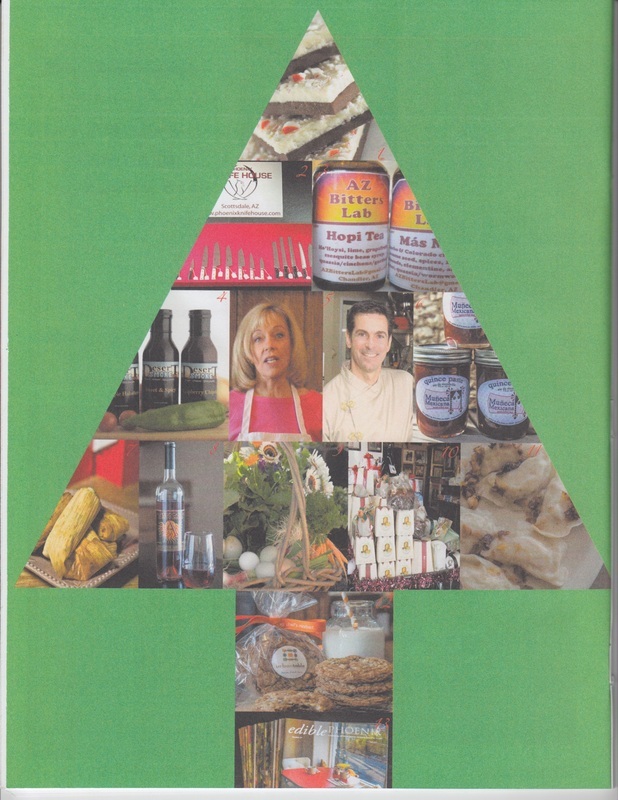 And cheers to a 2013 of fantastic food and drink!